Water appliances and pipes are located in numerous stations throughout a house and can leak or burst from any point to cause severe and costly water damage. 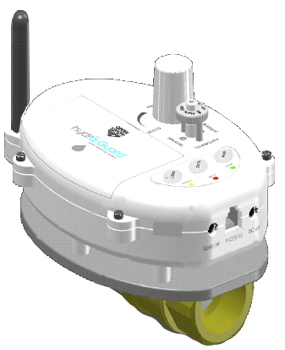 APEC's Whole House leak detector/shut-off device is an active point-of-use leak detection system that notifies homeowners with an alarm signal and automatically shuts off the water supply within a few seconds of a developing leak. 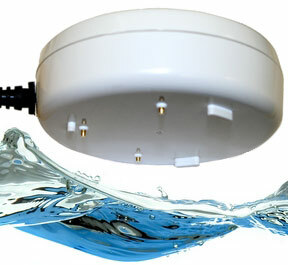 The quick detection and shut off capabilities of this system helps prevent more water from flowing and causing further damage and makes for a great low cost insurance policy that covers multiple water outlets throughout the entire house. 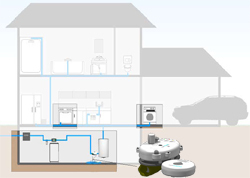 This smart home leak detection and water control system is a fully wireless, automatic operation unit that closes the central main water supply to protect your home against water damage. The system is equipped with the latest technologies. It consists of 1 motorized central 1" brass ball valve with manual override and 6 wireless R/F battery operated discs and 1 central main control box with graphic LCD screen. The system works either on batteries or electricity and can indicate when battery replacement is needed and where water damage may be occurring. It will run self-tests and features a special "holiday" function for long periods of absence. Whenever a leak is detected by one of the 6 sensors, the unit will automatically shut off the main water supply, making it the perfect whole house water protection solution. 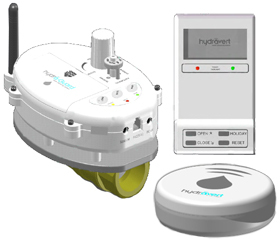 All six water-resistant sensor disks are individually equipped with 3 moisture detection probes capable of detecting water flow from 1 mm to direct contact with the floor. This state of the art technology allows the system to quickly shut off the water at the earliest sign of a leak to protect against water damage to your home and possessions.